This month there is little new. I press on to Bavaria with some delays due to bad weather. I will remain with Napoleon's army in this allied state until the outbreak of the war with Austria, wich will probably happen in June. I'll tell you in detail the situation when the war starts. Now finally, after many months of serenity the war is about to start, so it’s a good time to review the troops. Napoleon's army is almost as started the game, but a couple of new pontoon units have joined the corps that lacked them. These units allow a much faster river crossing and as well include engineers, increasing the ability to attack or defend fortresses and the speed of entrenchment. All corps also have a headquarters containing Medical Services, instructors and signal units, allowing greater recovery of cohesion, an improvement of the unit’s experience, and more command points. Other units present in all corps are the supply wagons, enhancing firepower and helping to maintain your forces well fed when they are away from your cities. The Grande Armee is the corps that directs Napoleon personally, aided as always by Marshal Berthier. In addition to units already described, it includes a reserve artillery directed by Caffarelli. The Imperial Guard is forming a separate body but I’ll usually keep it next to or adjacent to the body of Napoleon. Its commander, Bessières, is excellent. The body consists of an infantry division, an artillery brigade, a brigade of light cavalry and a brigade of heavy cavalry. All units are, of course, elite. 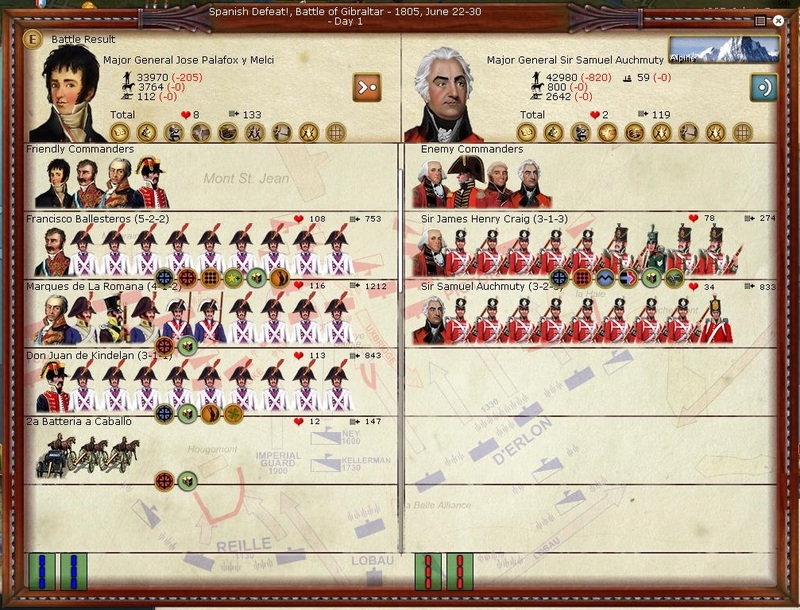 The first corps is that of Bernadotte, a great but unmotivated general. It has two divisions of infantry and light cavalry. The second corps is directed by Auguste de Marmont, a good administrator and gunner, containing two divisions of infantry and cavalry. Many of the soldiers are dutch, but there is no penalty thanks to General Grouchy, who heads one of the infantry divisions. The third corps is led by Davout, one of the best French generals. The three infantry divisions are among the best in the French army. A division of light cavalry completes the corps. Jean Soult leads the fourth corps. He’s one of the best French generals, not only for its excellent qualities, but also because he reduces by 25% the supply consumption. Soult has 4 infantry divisions, one light cavalry division and a brigade of corsican sharpshooters. The fifth corps is under the command of Lannes, a charismatic and able leader who improves the cohesion of his troops. The body consists of three infantry divisions and light cavalry division. The sixth corps is under the tutelage of Ney, a competent and charismatic general, as well as stubborn. Ney, understands perfectly the the light cavalry ability to hide movements and evade the enemy. Ney has three infantry divisions and one light cavalry division. The seventh corps is led by Augereau, a charismatic general who manages to increase the cohesion of its troops... but little fitted to command. It has two infantry divisions (very good ones), and a cavalry and artillery brigade. The last corps is that of Murat's cavalry reserve. Murat is an average commander, but has useful skills as charismatic and very fast rider. On the contrary he seems to delay too much the retreat from a battle. The corps contains medium and heavy cavalry divisions, but it also has a unit of dragoons on foot. The army of Italy, of course, is much smaller than that of Napoleon. Massena has a total of five corps. The army of Italy corps are not as prepared as the Grande Armee ones, and some corps lack pontoon units, which would help in northern Italy, full of rivers. Yet they are being constructed. But all corps have headquarters and supply units. Massena’s corps, the armée d'Italie, is composed of a pair of cavalry divisions (medium and heavy), a light cavalry division, a horse artillery division and an artillery brigade. 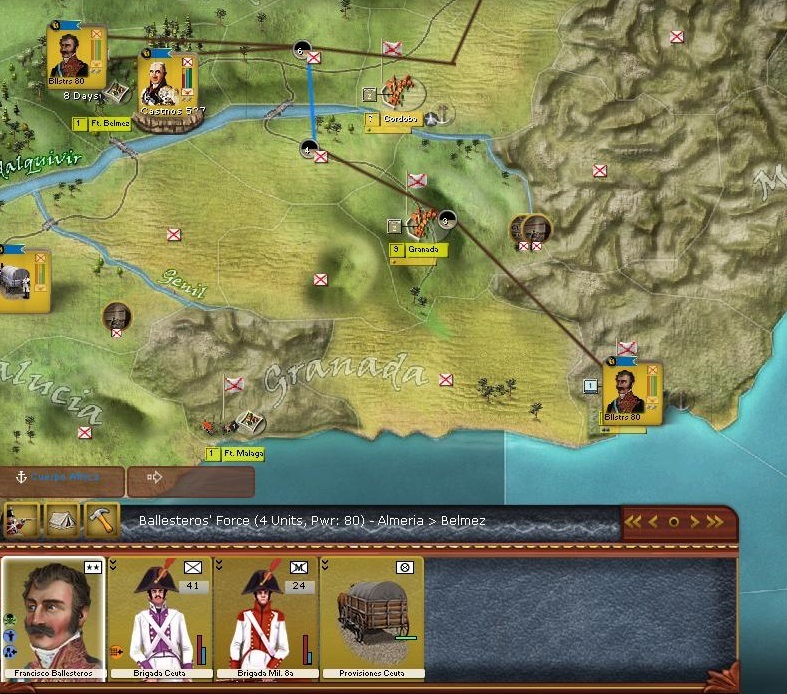 Massena is an excellent general in attack and defense, but his strategy value is medium. He is a hopeless looter, so people will see him as a tyrant and the loyalty to France is further reduced where he passes. He’s not too motivated, which reduces his units cohesion. The "center", the most powerful corps, is run by Partouneaux, an insurgents persecutor. It has 5 infantry divisions. The "left flank" is under the command of Duhesme, a hated occupier yet admired by his troops. He has 4 divisions in charge. 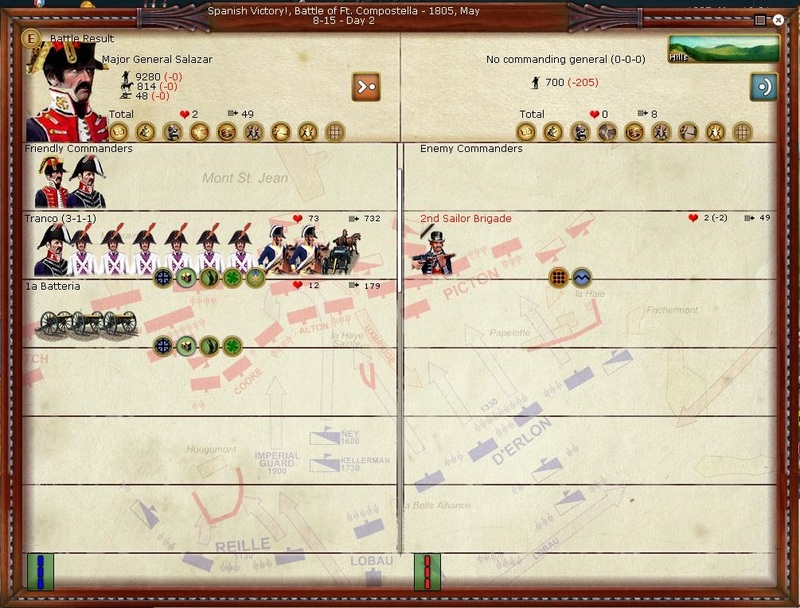 The "right wing", also with 4 divisions, is directed by Molitor, who seems to be the best overall Italy commander in numbers. 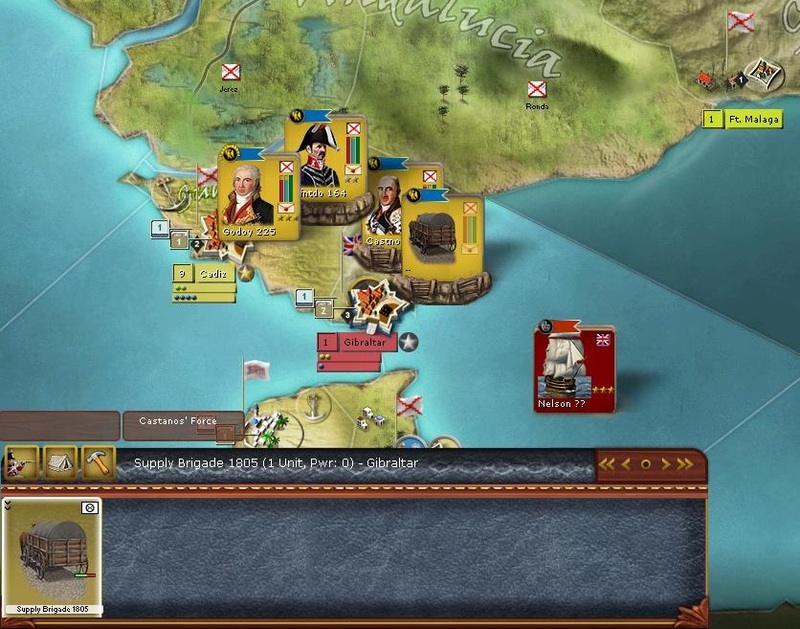 Furthermore, to compensate the harsh Duhesme and Massena, he is a good civil administrator, increasing the loyalty of the people, and an officer training, which improves two conscript units to regular units per turn if he does not move. The last corps is Gouvion’s one, a good defensive commander. Gouvion has only one Italian infantry division, a pair of light cavalry brigades, an artillery brigade and a horse artillery brigade. His mission now is to protect Genoa. After the French Revolution the absolutist kingdoms of Europe gather together in the first two coalitions to deal with the newly established Republic of France in what is known as the revolutionary wars. A young Napoleon arrives in France in these turbulent times and helps in the Italian campaign to defeat with his wit and courage the armies of the coalitions and to consolidate the government. However, with Napoleon in Egypt, the situation in France gets worse by a series of defeats to the Second Coalition, while the fame of the corsican continues to increase. Thus, the government brings him back to France to face an apparent invasion. However, despite when he returns the situation has improved militarily, France’s economy is ruined and the government is unpopular, which gives Napoleon and his followers the excuse for a coup and he places himself at the forefront of the country as Prime Consul, lifelong Consul and, eventually, Emperor. A citizen of humble origins had reached the top with his courage and intelligence. In his short life he had gone from being a young revolutionary man to an absolute monarch. His contradictory figure provoked both praise and criticism, love and hate. What was obvious was his great intelligence and ego. Enthroned like a roman emperor, Napoleon made and unmade at will, was venerated by french soldiers and citizens and feared by his enemies. Those were the days of Napoleon’s glory. Fsansir and I will narrate the campaign from the point of view of our side, the Franco-Spanish. From here we'll talk about our plans and how the campaign unfolds. We hope that you like it. Haplo, Is it possible for you to talk about GB's campaign please? If it is problem I understand. nice to see your planning ... always an interesting part of a good AAR. one question. Given the stack selection routine for combat are you not taking a bit of a chance with so many relatively small stacks in your army? You could get unlucky and have an elite formation targetted by a large enemy force.
" wrote: Haplo, Is it possible for you to talk about GB's campaign please? If it is problem I understand. Sorry, I don't think Haplo reads this AAR (at least I hope so!) because he would know all what I do.
" wrote: one question. Given the stack selection routine for combat are you not taking a bit of a chance with so many relatively small stacks in your army? You could get unlucky and have an elite formation targetted by a large enemy force. I've been out for these two months (work), but now I return with more Spanish updates. I’m sure that Rear-Admiral Strachan never though he would find a Spanish fleet in the Golfe de Gascogne that day, so he couldn’t made as much damage as he would like to do. 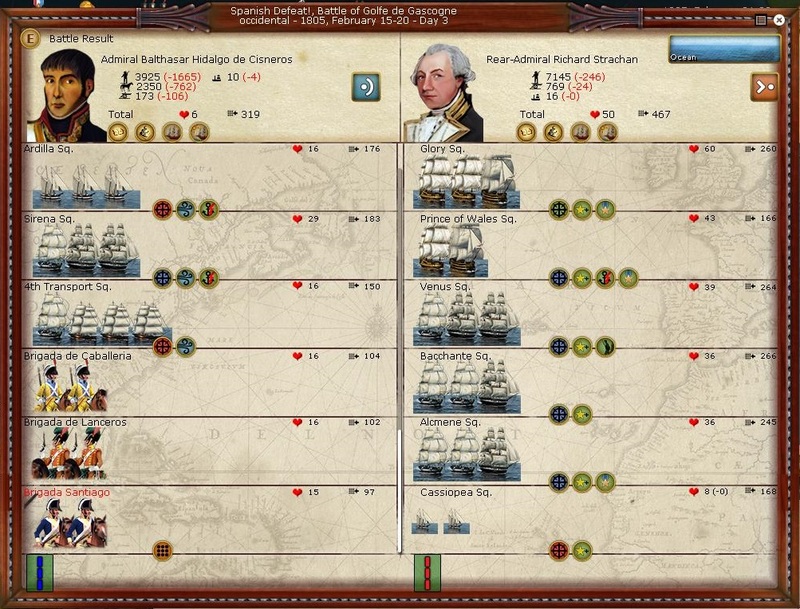 My ships, with evade orders, were able to escape with only four ships sunk. Bad news are that one of those ships were the transports carrying the Santiago Brigade. Anyway, for me this is good enough. Right now are more useful two cavalry brigades in the Peninsula than three in Cuba. 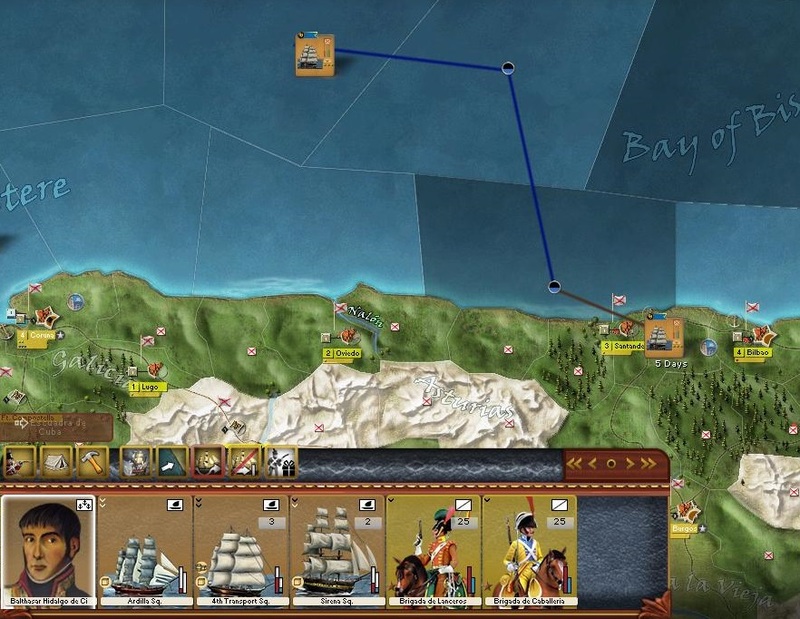 The cavalry will go to Sevilla, Cisneros to command the fleet in Cadiz and the remaining ships, after being repaired in Santander, will return to La Habana. It takes four months, but in May all the troops are ready in Cadiz. They are divided in two corps. The second corps will be commanded by Castaños and have two infantry divisions (one of them not ready because Caraffa has been inactive for more than 5 turns). This corps also have the engineers and the siege artillery because it will go as a second wave and do the siege after Palafox defeat the British troops outside the fort. These units are so weak that I didn’t bother to send troops to Ceuta, they couldn’t even scratch the walls with such a small force. They also tried to siege Santo Domingo with a strong force, but after playing the RGD scorched earth they had to retire due supply problems. At the second half of May, Palafox is ready to march against Gibraltar with (almost) all the Spanish army. 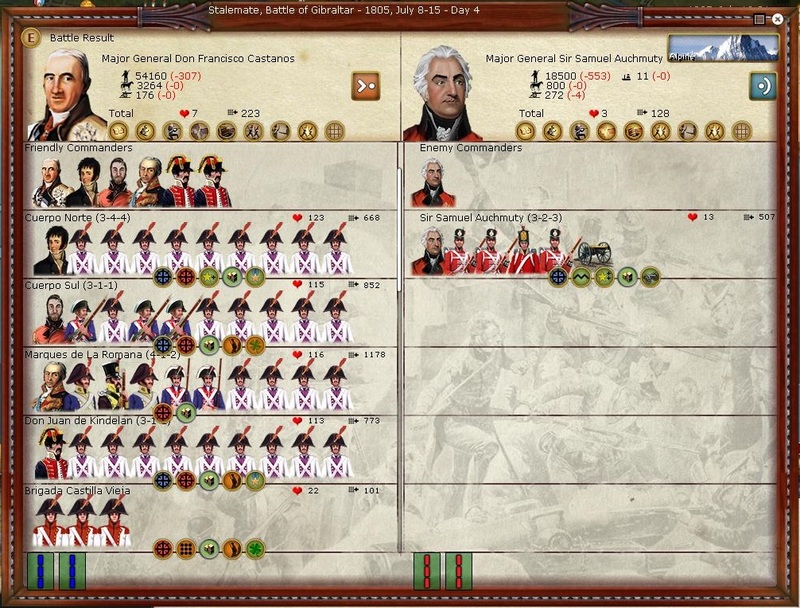 It’s a risky bet, because if a disaster happens and with my income of manpower and war supplies, rebuilding my regular army would be impossible and I’ll be out of this game since the very beginning. Anyway, I had follow a plan since the first turn towards where I'm now and I'll continue because the final prize (Gibraltar) is worthy enough. Palafox (3-4-4) arrives to Gibraltar on 18 May with 36,720 men and 112 guns. There, trenched and in high ground awaits Sir Samuel Auchmuty (3-2-3) with an small British army consisting in 16,630 men and 56 guns. The British confidence in their troops superior quality, better entrenchment and terrain (confidence not without base) didn't count with the Spanish determination (almost everything Spain can deploy is here), the superior numbers and leadership (Palafox is better than that Sir). Now I have a hold in Gibraltar and I'm not going to move any step back. 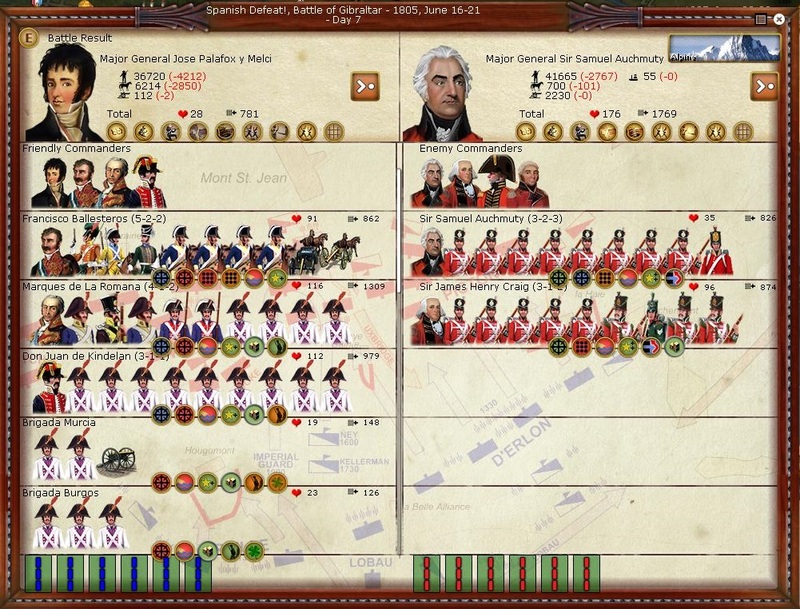 Palafox is in good shape, but the British had suffered important losses. What scares me most is that Nelson has dissapear and I'm afraid he went to bring reinforcements to Gibraltar. Just in case, I play the Defensive Works RGD to consolidate my positions. It isn't something to send against any British fleet, but it's a beginning. It's a dissaster. 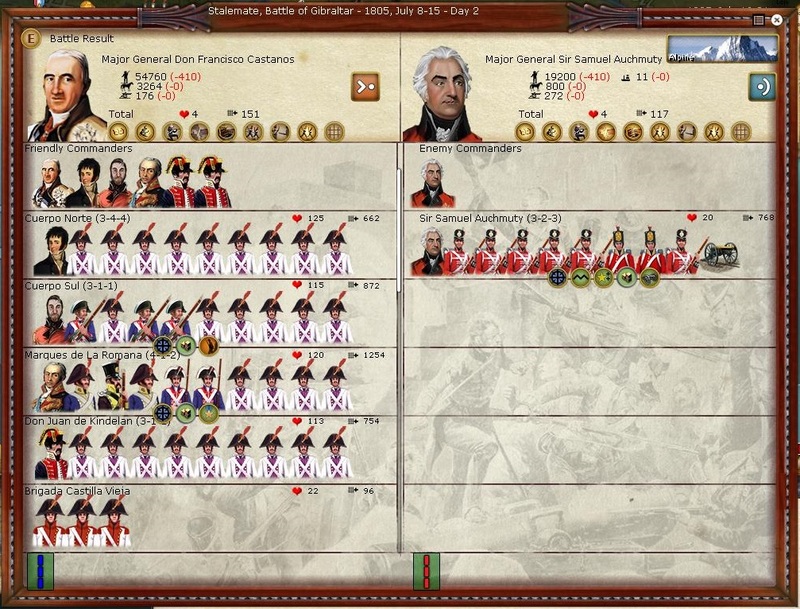 I've lost almost all my cavalry, General Zerain is killed and now I'm in inferior numbers. After this battle I've to think twice about all this stuff. 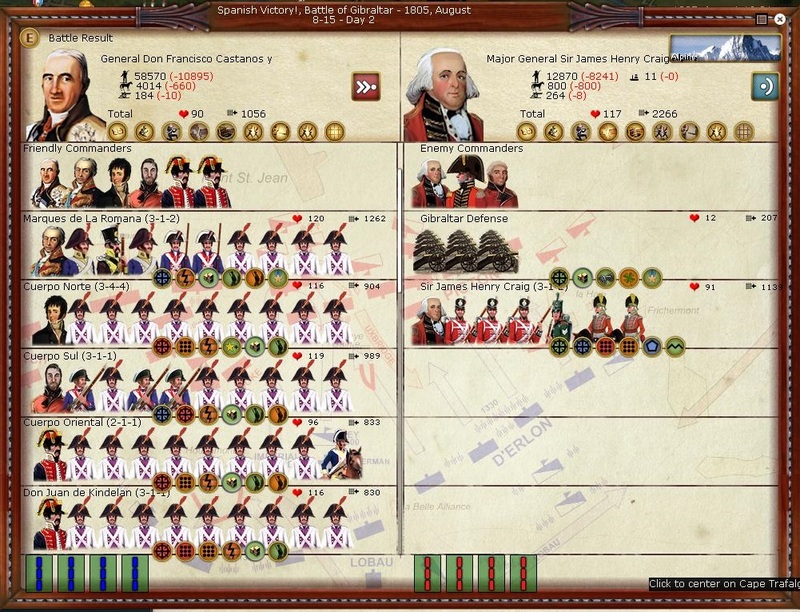 I still can retire from Gibraltar and save the army, but if I do this everything I´ve based my war plans would be a waste. I would have to start everything again, but where? No, I've to continue the attack. Gibraltar is the objetive and it looks like I'll have to rise the bets here. 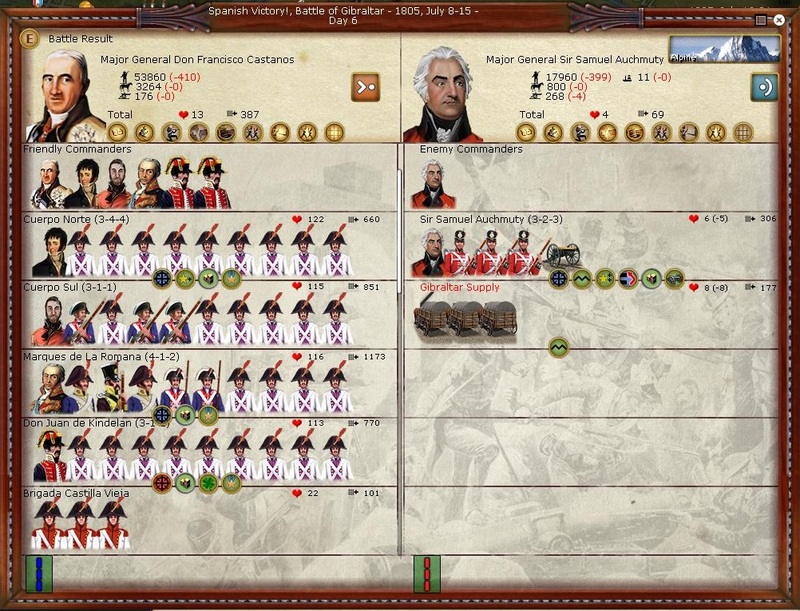 I reorganize Palafox army sending the decimated cavalry to Cadiz to recover and putting Ballesteros (former chief of the Cavalry Division) in charge of Zerain's infantry division. 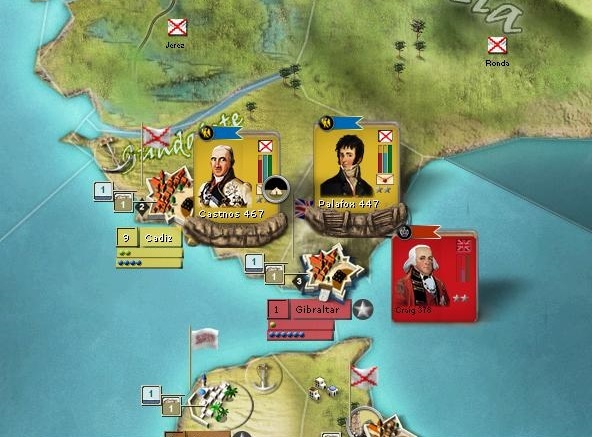 Palafox's army must resist in Gibraltar and maintain all the ground gained in the first attacks at all costs. Meantime, Castaños recives orders to march towards Gibraltar with his force in support of Palafox. With this I embark all Spanish Peninsular Regular Army into this crazy adventure. A pyrrhic victory, but we recover our superior numbers here. Thanks God, the garrison remains inside the fort unaware of these battles. Bad news about this last battle: Ballesteros is killed. He was one of my most promising officers. I have to rebuild again my forces. I join both armies in one commanded by Castaños and I send the most weakened brigades back to Cadiz to recover. Now I have a small command penalty for such a big stack (10%), but I must take advantage of my superiority and can't risk one stack not joining the other when attacking, so I think it's better to have everybody together. The British reinforcements (Malta army, according intel) disappears and Sir Samuel must face alone all the Spanish army. At the end, he can't avoid defeat and have to retreat inside the fortress. At the end of the week, the field is mine with a supply train left by the British in their retreat. Castaños begins the siege with 4 infantry divisions supported by the units built in advance for this situation with a lot of sacrifice by the scarce Spanish economy: a siege artillery regiment and another one of engineers. He's also ready for a long siege scenario with his 5 supply trains and a field hospital. 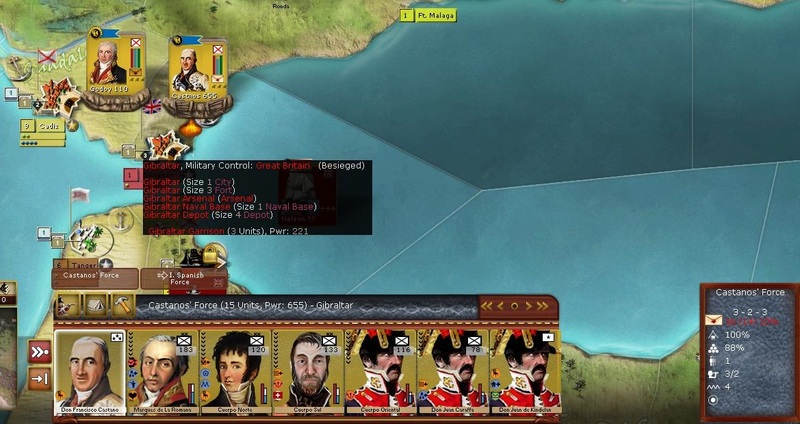 I'm afraid the British will use their sea superiority to bring reinforcements to Gibraltar, so I need to force a quick siege here or my days in Gibraltar would be counted. I use my both breach RGD (thanks to my engineers rgt.). I sucede with both RGDs and also made another breach with my artillery, so in the second week in August I have the three breaches I need to storm the fortress (level 3 fort). 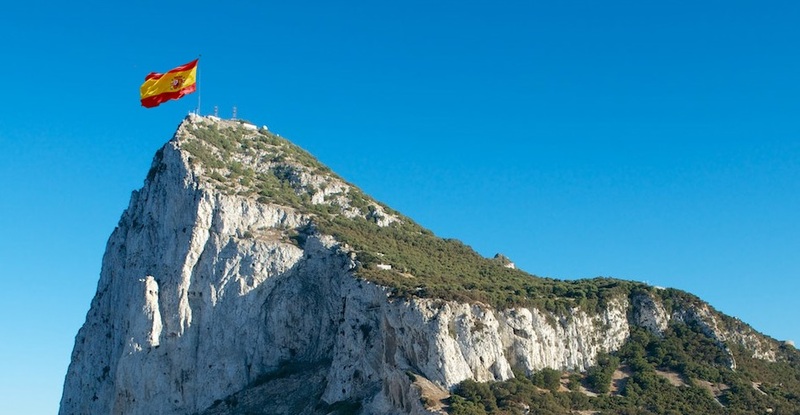 Now is the moment, everything looks right for Spain retaking Gibraltar at last. But I'm still wavering... A failure here means the game over for me, I'm about to risk ALL my army assaulting an impregnable fortress. I'm not usually so hesitant, but it's an all or nothing bet here. The assault quickly turns into a slaughter of Spanish and British soldiers. Inside the fortress is the Malta British Army (disappeared in previous battles) and the fort garrison. They are surpassed by 5 to 1, but they plant an stubborn defence. So stuborn that almost all the British are death at the end of the battle, but the British flag remains over the rock. Their bravery and better positioning are not enough to stop 58,000 Spanish. I've lost one fivth of my army which has passed from 1,000 power to 655. 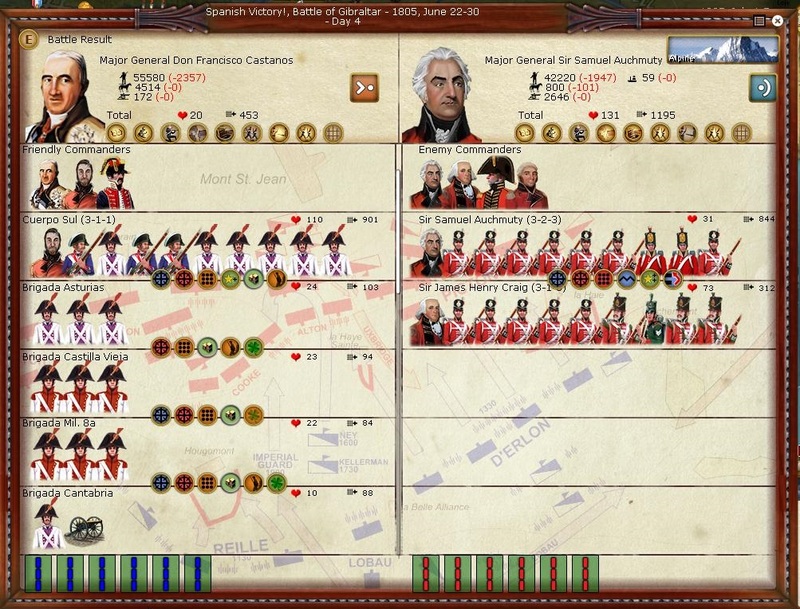 This means that with Spanish economy, my army will not recover the losses of this battle in a year. But I've to continue the pressure, as far as I know, right now a British fleet may be bringing here elief expedition. I've to finish this siege now, no matter the shape of my troops, the enemy's is worst. There is no rest, I order another assault for the next turn. I gain 10 NM and a lot of PVs. Also, the fort batteries and the coastal guns are mine now. 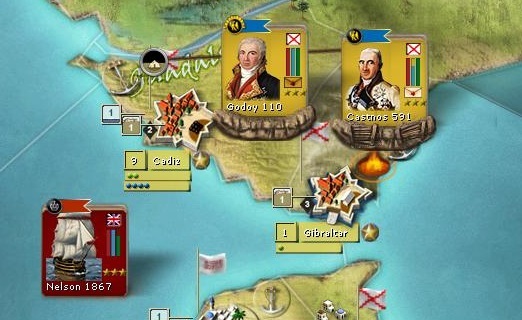 For the British this means a drop in their NM, Pvs and -10 of war score (-1 more for each turn they not control Gibraltar), so I have to plan the defense because they can take an army here whenever they want. I join the most damaged brigades in a weak division and take them inside the fort with all the captured artillery. That should work for now. Thank you very much Pans. It's a hard work so we appreciate you're enjoying the AAR. Fsansir wrote: Thank you very much Pans. It's a hard work so we appreciate you're enjoying the AAR. Now, I´ll let the Emperor tell the last news from Europe until my next campaign (still don't know where). Cannot understand why Gibraltar is only worth 3. Surely the loss of Gib. meant that naval movement toand from med./repair is very serious? Wonder what developers thinking was. During the first two weeks the Grande Armee goes into Württemberg and Bavaria. Napoleon’s army always moves through non-border areas, so it will not be detected by the coalition thanks to the "fog of war". We do not know where the Austrian army is, except the corps in the Alpine border with Bavaria, that seem quite strong (about 12 divisions), located behind rivers and on a forest that favors them. Therefore the intention is to move towards Bohemia, an area of relatively flat terrain, to surround those bodies of Austrian army from the north and avoid exhaustion in a clash that could be quite expensive. Ney’s 6th corps, located in Ulm (Württemberg), is launched against the small Alpine cities of Ueberlingen and Memmingen. It does so in relentless assault position, so that in theory, in only five days, he will assault the two cities in the same turn without stopping. Time is gold. Ney get it, but so too outstanding ... both level 1 cities disappear from the map. I think this is one of the things that was corrected with the patches that have been coming out, so I do not think nowadays these cities could disappear like that. This is a problem because it may prevent the supply flow to eastern Bavaria, but you have to resign yourself... if I had known rather than raiding the cities I would have besieged them to surrender. The last week of June, Ney pursues a couple of small austrian units that had survived in the area, though some more escape. Lannes and his 5th corps start their journey from Regensburg (Bavaria) to Bohemia. They target the cities of Pilsen and Eger, where they can put one foot in Bohemia to go to Prague. However, this move will stop at the border mountains, and from there he’ll see if there are defending forces in Eger and Pilsen and decide what to do next. We must not stop but without being unwary. 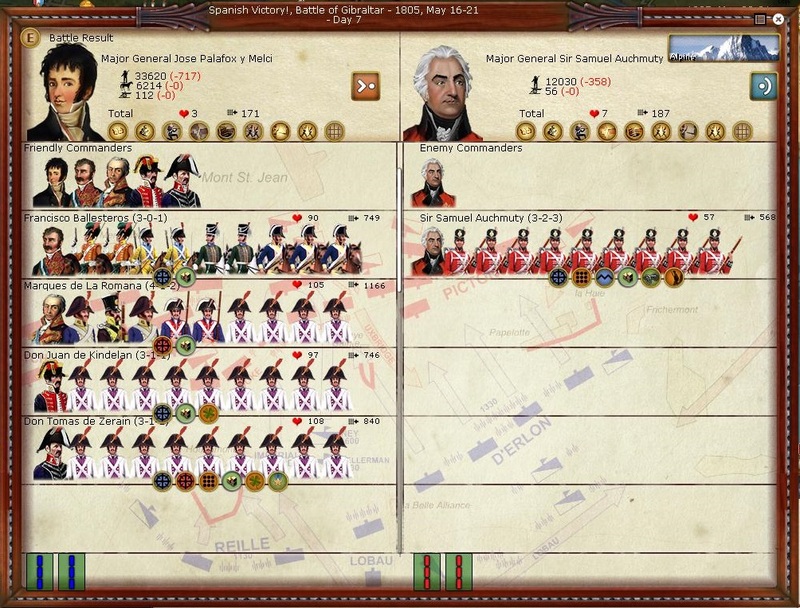 As I don’t know if Austria knows the Napoleon's army position, I decide to keep enough units in Regensburg if the Austrian army decided to move toward it. I only move the Soult corps, to surround the Austrians if they enter into Bavaria without a previous reconaissance. The month ends with Lannes taking Pilsen, city that surrenders without firing a single shot. The army of Italy will not be so cautious. Massena orders all their bodies forward dodging Padova, which will be besieged by François de Chasseloup-Laubat commanding a force composed of an infantry division supported by siege engineers. The central corps, reinforced with more divisions from the other ones, will be the only corps that enters Treviso, while the rest will remain at a region distance to support it while defending the rear. But the Austrians are not in Treviso. So Partoneaux assaults the city and takes it the last week of June, gaining 4 points of national morale. Meanwhile, the remaining corps are advancing unopposed toward Trieste. Venice is left behind because taking it would be costly without a port blockade. Napoleon's army follows the route plan divided in two: a force that progress into Bohemia to take Prague and keep moving eastward to surround the army that clogs in the foot of the Alps, cutting the road to Vienna south of the Danube. So Napoleon decides to assault and send explorers to Tabor: no trace of Austrian troops. The taking of a city like Prague may seem important but it’s not really that much. In Napoleon's plans it’s only a strategic city. Not among the objectives of France. 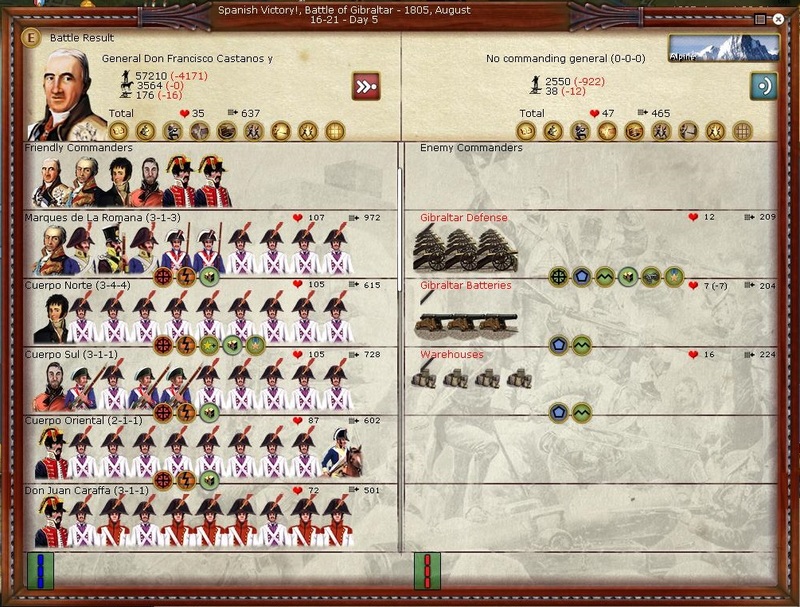 At this point I start to observe a worrying shortage of supplies in Napoleon's army that has penetrated into Bohemia. It seems that for some reason they do not flow to Prague. Does it have something to do with the disappearance of those two Level 1 cities that I mentioned in my previous post? I am about to create and expand existing deposits in Pilsen and Eger to see if the supplies begin to flow… or the emperor’s plans will go to ruin. Just in case the supplies don’t flow and to reduce the consumption of these in Prague, Bernadotte and Murat are sent to these cities. Lannes advances and takes Tabor without firing a shot. Massena and his commanders move through the Veneto towards the present Slovenia. This is a main road, but due to the rivers and poor civilized areas progress is slower than elsewhere. 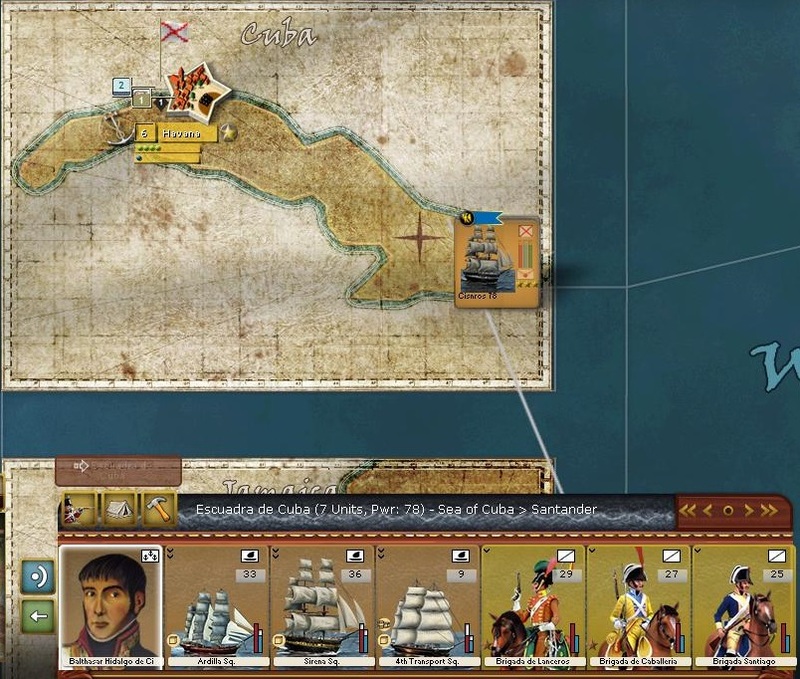 In the second week they finally detect in Trieste its Austrian equivalent: the Italianische Armee, led by Archduke Karl, a general who stands out in the Austrian army with values of 4 on all of his characteristics: strategic, offensive and defensive. His forces are entrenched behind the Isonzo River in a steep terrain. However the entrenchment level is not too high yet and if I do not attack at this time the forces of the archduke will be more difficult to expel, so Massena commands the most advanced corps, Gabriel Molitor’s "Flanc Droit", crossing the Isonzo through the mountains of Caporetto and from there down to Trieste in order to avoid the difficulties of a direct river crossing into the city. The corps of Massena, Partoneaux and Duhesme will support Molitor from across the river... if I have luck in the "march to the sound of guns" dice throw. But fortunately (or unfortunately, you never know) Gonzalo takes the Italianische Armée out of Trieste and there’s no fight. Perhaps that abandoning of the city by the Austrian nobleman leads to the surrender of Trieste the same turn. These are great news because it is a strategic and vital city if I want to advance to Vienna from Italy. Massena smiles slyly and fills himself up of wine and women in Trieste. When the hangover ends, he continues his advance with the fresh forces. Molitor’s soldiers are recover themselves in Trieste. Partouneaux arrives to Fiume and puts it under siege, while the explorers approach to Laibach but find no trace of Archduke Karl... Where is he gone? Towards Vienna, Hungary or the Balkans? As you can see in general everything goes ver well for the French side and both Napoleon's army as Massena have made significant progress. The only drawback is the problem of supplies in Bohemia, which can be very annoying. Your French ally should help you secure it for common interests, that is a great victory and a price. Austrian army has most likely retreated to join with the Russian army, also possibly the Prussians. They will most likely attack the corps that are most distant from your main body, at this time Soult and Ney. You should send your cavalry to scout every turn and find them. Other possibility is that they will try to capture your Italian army, form one corps to block the Brenner pass. You should also secure Venice fast, you have everything you need for a successful siege. ¡Larga vida a los Peninsulares! Assuming you are white, if your wife is mestiza, then your children are called "castizos". In spanish a criollo is an european descendant born in America, so 100 % white. While a castizo is 75% white and 25% native american.